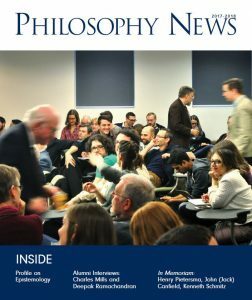 The 2017-18 edition of Philosophy News is available now, in print and digital. The Department of Philosophy began publishing an annual newsletter in 1991. It has since grown into a full-colour magazine, in both print and digital form, which contains updates from the most recent academic year from all three campuses. The newsletter/magazine features staffing updates (new faculty, retirements), in memoria, new books by faculty, awards and honours received by faculty and students, and selected short articles on and interviews with philosophy community members.